Quiet and compact air purification system changes the air up to six times per hour. Reduces common household odors, including pet odors, up to 30% better than other leading brands. Clean Air Delivery Rates of 101 smoke, 120 dust, and 120 pollen. With separate carbon pre-filter, ionizer, and three speed fan. Portable, compact design is ideal for floor or bookshelf use. Whisper-Quiet Hunter Fan draws air into the unit without the noise associated with many competitive models. Advanced Activated Carbon Pre-Filter reduces cooking, tobacco, and pet odors at least 30% better than competitive models. Also captures large dust particles, lint, and pet hair from dirty air. Permanently charged HEPAtech Electret Filter effectively captures 99.97% of particles as small as 0.1 micron in size that pass through the filter. Ionizer distributes negative ions throughout the room to enhance the cleaning process while freshening the air. Effective Airflow Design exhausts clean, purified air back into the room from the top of the unit to avoid stirring up settled particles. 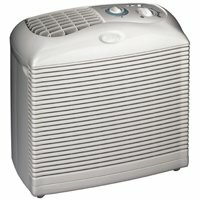 How do I select the right size air purifier for my needs? CADR ratings should be used when selecting your air purifier. These are scores from independent laboratory testing which simulates real world conditions. The higher the score, the better the unit cleans a room. How is performance or effectiveness rated on air purifiers?